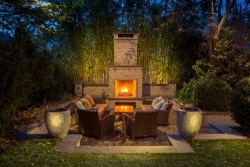 Outdoor living can now approach 40% of total project costs. Coastal Source advises CE pros to create ‘special features’ to help landscape architects’ plans stand out. Our company started offering lighting and sound system installations about 5 years ago. We also started offering landscaping designs about 9 years ago. It is different than the traditional lawn care we did before. Architecture is very important in this process and there’s more on the line when you’re doing a landscaping overhaul. It’s definitely more work and coordination but the results are worth the time and effort.